Ultra Pro stock number 82910. 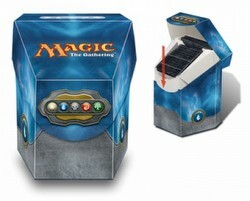 The Commander Mana Blue deck box holds 25+ oversized cards *plus* 100 standard cards with Ultra Pro deck protector sleeves (sleeves not included). It has a removable inner card holder as well as a write-on strip for labeling.